This is just one part of a much bigger subscriptions scope. Here are some other helpful KB's to help guide your way to sucessfully creating subscriptions. Subscriptions, or recurring orders, are a great way to increase sales by allowing orders to be automatically generated at any interval that are charged instantly. Note, subscriptions only work for orders which were paid for using a credit card. Subscriptions can be created automatically by the system or manually through the administration console. Each has its own set of abilities as well as limitations – this will help you determine which setup is right for you. Entire Order – This will take each and every order and make a subscription out of it. It simply copies over the order information of the entire cart – no recalculation of price is done. It pulls all items regardless of whether they were marked as Subscription Products or not. Subscription Frequency Type – Sets the type of interval [Days, Weeks, Months, Years] or noRenewal. Subscription Frequency – A text field that sets the length of the frequency. For example, putting a 3 in this field with Month in the previous would renew the subscription every 3 months. Auto-Renew Subscription – If checked, a new order will be placed every time the subscription is set to renew. Otherwise, the subscription will need to be manually processed. Prepaid Subscriptions - Number of Prepaid subscription orders. For example, if the prepaid is set to 3, subscription for this product will charge at the product's price when the order is created, and renew 2 times without charge. Cancel After Prepaid Renews - When using prepaid subscriptions, the subscription can be canceled after prepaid renewals are complete, or be renewed at original subscription’s frequency and price. Any Auto-Create Subscription type except: "None"
Any Subscription Frequency Type except: "noRenewal"
These settings are only necessary if you are using the "SubscriptionProductsOnly" subscription type. Navigate to Orders > All/Open Orders. Find the order you wish to create a subscription from and select it. Note: Only one type of subscription is allowed to be in use at a time. Once you begin assigning a type to subscriptions, all other subscriptions must use that type. 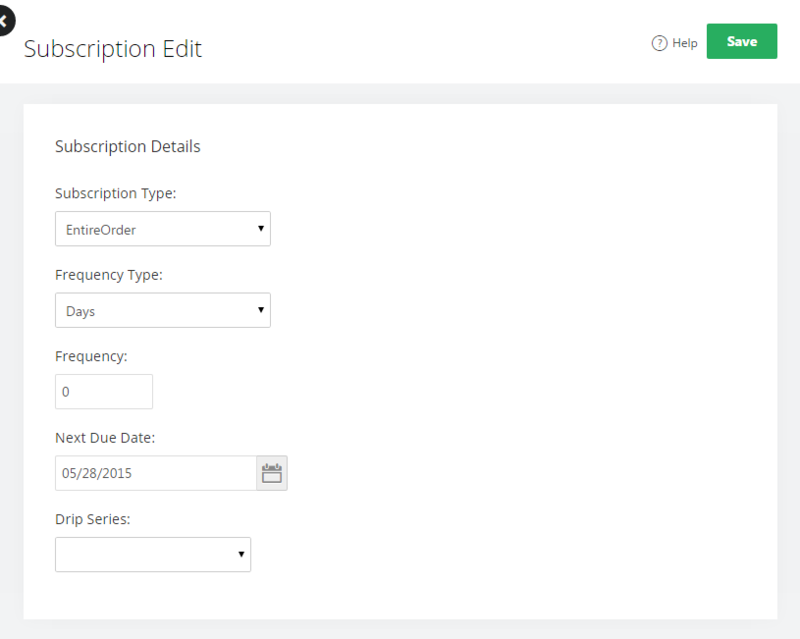 See item 2 in the Subscription Setting Setup for a breakdown in how the two different types work. Subscription Frequency Type – Defaults to your settings above, but can be overridden here. Subscription Frequency – Defaults to your settings above, but can be overridden here. Enable Variable Subscription Types - Combined with Subscription Frequency, this defines how often a Subscription should renew. Defined Variable Subscription Types - Combined with Subscription Frequency, this defines how often a Subscription should renew. Subscription Renewal Type of Day - Explicitly set the time of day at which you would like for subscription renewals to take place. Auto - Renew Subscriptions - If this Store Setting is enabled, after an order is successfully placed and paid, a subscription will be automatically created based on the Auto Create Subscription type and either the Store level or Product level Subscription Frequency, whichever applies. If a customer places an order with multiple products but only wants one as a subscription, how can this be set up? There are only 2 options that allow this. The first is to use SubscriptionProductOnly type in your subscription types, This way, when the subscription is created, it will only include the items marked as subscriptions. If you are using EntireOrder subscriptions, the only other option is to use manual subscription creation in conjunction with our split order functionality. In the later option, split the order so that the subscription items are in a seperate order and manually create the subscription based off of that order. For more information on the split order feature, view the related article below. How can administrators and customers either delete or stop a subscription? Customers can enable or disable their subscriptions from the My Account page. However this will not delete the subscription, but simply stop it from renewing. 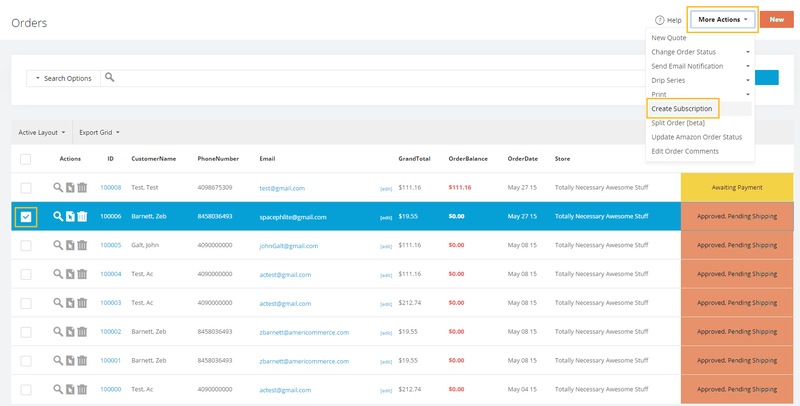 Via the admin console, subscriptions can be cancelled in the subscriptions listing page located at Orders > Subscriptions. From here, the subscriptions can also be edited to no longer renew. Is PayPal payment supported with subscriptions? No, it is not supported unless you are using PayPal Payment Pro as your payment gateway. If a subscription is created from an order paid for with any PayPal gateway besides Payments Pro, it will fail to renew. Also note that renewing will only work for credit cards, but will not work for actual PayPal accounts. Can I view which orders are subscriptions from my orders list page? Yes, you can select "FromSubscriptionID" from the "choose Columns" icon on the Orders>All orders page. Can I manually renew a subscription even if it's already set for Auto-renew? Select the checkbox next to the order(s) you'd like to renew and from the action menu select "renew subscriptions"
How do I know if a subscription order declined? On the subscription Orders page (Orders>Subscriptions), there is a column titled "Is Renewal Payment Declined" if it says True, then the payment declined. If it says false, the payment is valid and has not declined. When I click on **"How do I know if a subscription order declined?" **no expansion text shows up. On the subscription Orders page Orders>Subscriptions, there is a column titled "Is Renewal Payment Declined" if it says True, then the payment declined. If it says false, the payment is valid and has not declined. if someone purchases a subscription with Paypal, what happens? Does the order go through? Will a new order be placed automatically at the following subscription intervals until the the renew time comes? If a new order goes through will it be paid for by PayPal? And.....how do we know if a subscription order is declined? Thanks!